Laminate Countertops - Should I replace or refinish? Laminate countertops are available in many colors and patterns and marketed under brand names like Formica® and Wilsonart®. Laminate countertops are good choices for kitchen worktops because they are economical, non-porous, and available in many colors. However, laminate counters once they become chipped, cut, worn out, or out-of-style are candidates for refinishing. If you like the layout of your laminate kitchen counters, then you should consider refinishing. 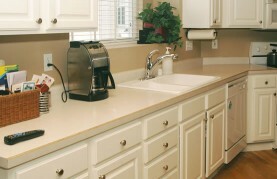 Refinishing can completely restore your laminate countertops to a like-new condition and feel. And dozens of colors and textures are available to you, including a stone look using Miracle Method’s Natural Accents. 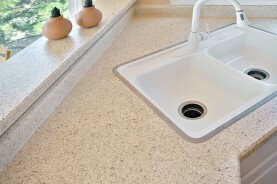 Miracle Method Refinishing makes your countertops look like new! If you don't like the color or condition of your laminate - we can change it! Laminate Countertops – What is the countertop refinishing process? 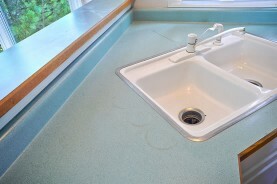 Laminate countertops can be painted or they can be refinished. Any type of enamel or latex paint can be sprayed or rolled onto a laminate countertop, but you’ll be disappointed unless you have them professionally done. A professional will thoroughly clean the surface, repair knife cuts and chips, apply a special bonding agent, and then apply several coats of a high tech acrylic enamel. A properly refinished laminate countertop will last for many years with everyday use and normal care and cleaning. Laminate Countertops - What are the advantages of refinishing? 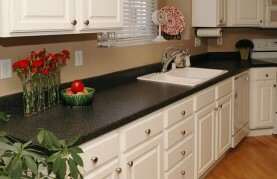 Refinishing laminate countertops will almost always be more affordable than replacement. It will certainly be faster and cleaner to refinish rather than replace. The best way to make a decision is to get quotes for both replacement and refinishing of your laminate countertops. Compare cost, downtime of your kitchen, and the hassle factor of reconstruction, and then decide which option is best for you. Knife cuts, chips, torn end caps, and de-lamination from repeated water saturation on laminate countertops are impossible to repair. This damage will disappear when Miracle Method refinishes a kitchen countertop resulting in a restored surface that looks like new. Laminate Countertops - How do I find a professional to refinish laminate countertops? If you are interested in having your Formica® or Wilsonart® laminate countertops refinished, click Find a Location or call our toll free locator number, 1-888-271-7690, for the nearest Miracle Method office to get a free estimate for countertop refinishing.